If writers should, “write what they know,” should artists do the same? According to Anya Tish’s third installment of Homage to Domestic Familiarity, the answer is no. While the artists in this show are indeed using “banal” objects as both subject and object, the peculiar nature of art (and its audience) nudges them into surrealist and dada-esque territory. It’s familiar inasmuch as we recognize the stuff of middle-class contemporary American living, but the prime mover here is the contrast between the individual artist’s experiences, the collision of opposing milieus which is intensified by the show’s setting and title. The result is a viewing experience that’s one step removed, one which curiously reveals more about the mythology of America and Middle Class and Suburbia than about actual life in the ‘burbs. As expected, mass-production and mass-consumption make multiple appearances in “Homage…” James Zamora’s wall-filling, Flags of the World is a painterly depiction of fluorescently lit packaged cheese at a grocery store. 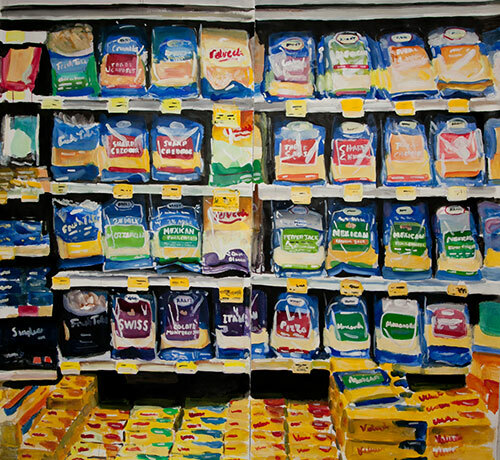 The focus in this painting is the brightly colored packaging and the labels which proclaim the nationality of each shredded or sliced dairy product. The colors are saccharine, and it isn’t quite as lovingly executed as his adjacent smaller paintings, both of which recall Dutch still life. Still, if a slightly moldy rind in a Van so-and-so symbolizes the brevity of life, than Zamora’s cheese hints at the possibility of living forever, albeit in refrigerated and vacuum-packed ubiquity. Such stylized renditions of over-consumption are evident in the work of Jonathan Clark and Daniela Edburg, to vastly different effect. 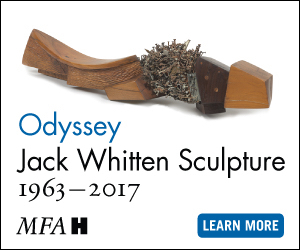 Clark, riding the wave of what might be referred to as ‘accumulation art,’ creates Oldenburg-scaled objects out of amassed particulates. “Match” is fun to look at but somewhat maddening in terms of its obsessive one-note nature. Edburg’s Spinster is an image of a frantically knitting woman. It recalls hoarders and agoraphobics, but the exaggerated figure and hyper-saturated pink yarn are more fun than frightening, even in all their tentacle-like anthropomorphism. Mohammed al Shammarey’s Arab Cola adds a more serious inflection to this dialogue, one which is easily juxtaposed with Shelby David Meier’s tumbling Whataburger cups. Both raise the specter of garbage, of the immediate detritus created in a single-use society. But while Meier’s roll jerkily about on the floor like fast-food jumping beans, Shammarey’s elegant three-part image of a dishdasha clad man juxtaposed against Coca-Cola red sets up an open-ended narrative. The crushed final can reads like a question mark. Is this the goal of Western interests in the Middle East? Is the flattening a physical or cultural one? However cumbersome the title, Homage to Domestic Familiarity III, it is appropriate. This exhibition doesn’t purport to show us day-to-day existence, it takes our humdrum stuff and interprets it voyeuristically. None of these pieces feel autobiographical, which is interesting because it speaks to the intended audience. (It’s hard to imagine well-heeled collectors buying ambiguously labeled “Italian Cheese” in a store lit like an OR) It’s the irony and weirdness of these symbols that each artist seems to be marveling at, not their familiarity.